Flowers placed at the Tree of Life synagogue. On Saturday morning (Oct 27. ), 11 people were killed at Tree of Life synagogue in Pittsburgh, Pennsylvania. It was the seventh mass shooting of 2017 (defined by the Washington Post a lone gunman killing four or more people). Mass shootings like this are taking a toll on Americans’ psyches. The latest evidence comes from the Survey of Americans Fears, recently released by researchers at Chapman University. 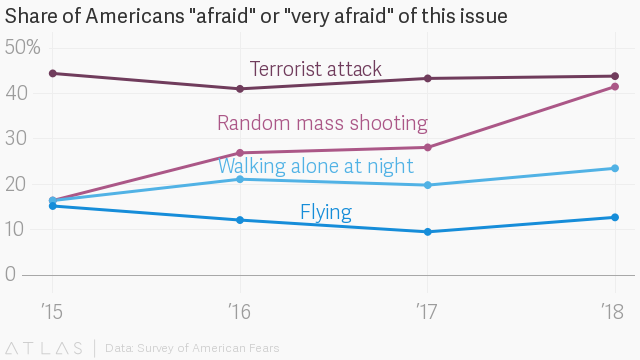 Since 2015, the survey asked Americans, “How afraid are you of being the victim [of a random/mass shooting]?” The number of people who say they are “afraid” or “very afraid” has skyrocketed from about 16% of adults in 2015 to 42% in 2018. The demographer Cheryl Russel first identified the trend. No other fear asked about in the survey saw as great an increase. The only other fear to see a twenty-point increase was concerns about the effects of “global warming and climate change.” Over 1,000 people each year were surveyed. The respondents are representative of the US population.